SOFIA: Britain risks crashing out of the EU without a withdrawal deal unless substantial progress is made in talks ahead of a crucial summit next month, the Irish prime minister warned Thursday. Leo Varadkar said he had yet to see a proposal from London that “remotely approaches” a solution to the vexed question of the border between Ireland and Northern Ireland. British Prime Minister Theresa May, facing bitter splits in her government over the post-Brexit trading relationship with the bloc, held one-on-one talks with Varadkar and EU Council President Donald Tusk on the sidelines of a summit in Sofia. Varadkar warned that time was running out to agree the terms of Britain’s withdrawal agreement, saying a June 28-29 summit in Brussels would be vital. 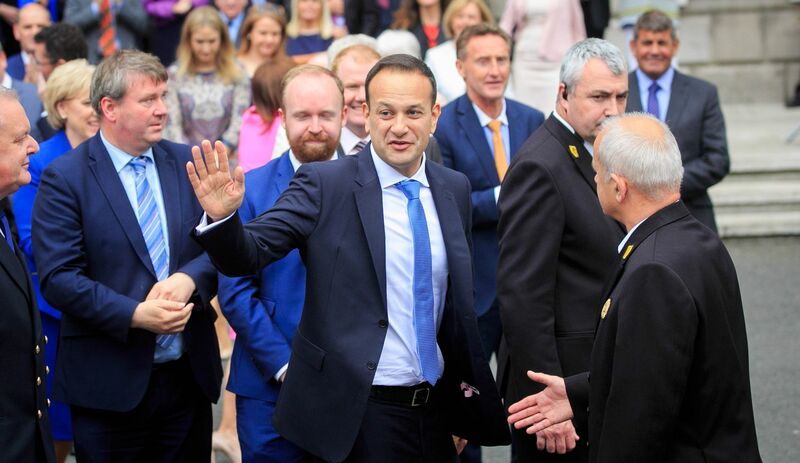 “The deadline for the withdrawal agreement is October, but if we’re not making real and substantial progress by June then we need to seriously question whether we’re going to have a withdrawal agreement at all,” Varadkar told reporters as he arrived for the summit. His warning piles pressure on London to come up with a solution to avoid a “hard” border between the British province of Northern Ireland and EU member Ireland. It comes after EU Brexit negotiator Michel Barnier fired a broadside at Britain on Monday, saying there had been little movement in talks since leaders last met in March. The EU has suggested a “backstop” proposal for the Irish border in which only Northern Ireland would stay in a customs union post-Brexit, but London says that would effectively create a border between Northern Ireland and the rest of the UK. Varadkar urged May to come up with concrete proposals for what do to with the border. “But we need to see it written down in black and white, we need to know it’s workable and legally operable and we’ve yet to see anything that remotely approaches that,” Varadkar said. Britain’s Telegraph newspaper reported Thursday that a cabinet sub-committee this week agreed Britain would stay aligned to EU customs rules, possibly until two years after the transition phase ends in December 2020. Britain is due to leave the European Union in March 2019 but continue the current trading arrangements during the transition, to give time for the two sides to agree the terms of a new partnership.